This circle will help to maintain positive changes made through restorative dialogue and other activities that have a positive effect on classroom climate. Students will evaluate their class’s compliance with the guidelines and agreements. Students will identify issues with guidelines and agreements and propose solutions. If they are to remain healthy, every relationship, group and community needs ways to revisit, renegotiate, and maintain agreements. Your class is no exception. This circle is an opportunity to check in about how we are doing with the agreements we have made, and to see if they need revising. What have you noticed about how this class is doing with the circle guidelines? What have you noticed about how this class is doing with its class agreements? (If problems have been identified): Who do you think is affected by these issues, and how? What is the hardest part for you personally? What do you think can be done to make things right? 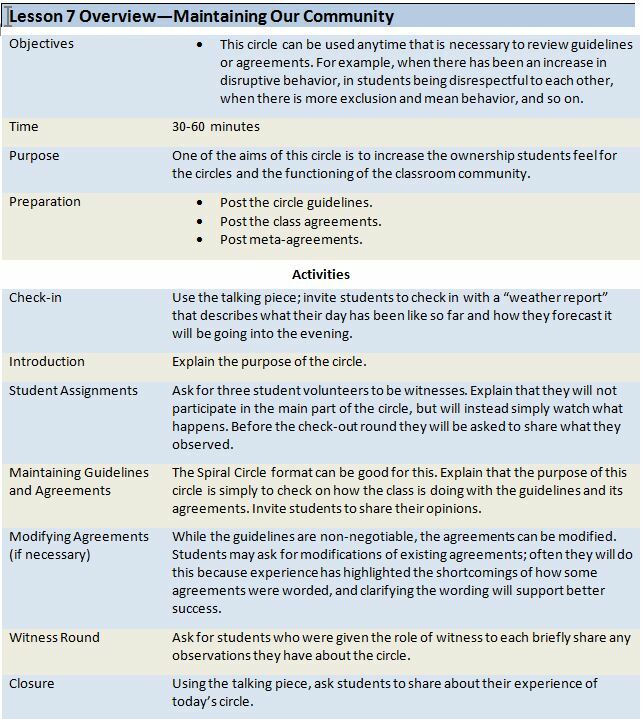 If it becomes apparent that there are agreements that need to be discussed and modified, or if students want to make new agreements, remind students of the meta-agreements. Then use the “Fists to Five” method to support students’ exploration of agreements (refer to Lesson Plan 2). Using the talking piece, ask students to share about their experience of today’s circle.